Have you or a loved one been seriously injured in a Bicycle Accident? Drivers of motor vehicles share the road with bicyclists. Drivers need to be careful and respectful of bicyclists, because bike accidents involving collisions with cars, trucks and other motor vehicles can cause bicyclists severe bodily injuries or fatalities. According to the U.S. Department of Transportation, National Highway Traffic Safety Administration, drivers of motor vehicles need to allow at least three feet of clearance when passing a bicyclist on the road, look for cyclists before opening a car door or pulling out from a parking space, and yield to bicyclists at intersections and as directed by signs and signals. And drivers of motor vehicles need to be especially watchful for bicyclists when making turns and merging. When drivers of motor vehicles breach their duty of care and behave negligently, bicycle accidents occur, which can result in severe injuries or death to innocent bicyclists. Personal injuries suffered by bicyclist can include broken bones, neck injuries, spinal cord injuries, brain damage, road rashes, cuts, bruises and more, all of which cause severe pain and suffering. 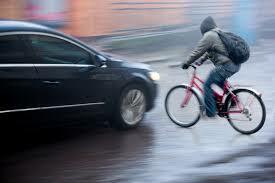 If the bicycle accident happened in Arizona, Bicycle accident lawyer Randal Hutson in Phoenix may help. If you or a loved one has been injured in a life-altering bicycle accident in Arizona, or tragic wrongful death accident, contact The Hutson Law Firm, PLLC. Personal injury attorney Randal Hutson will work hard to get you the compensation you deserve to cover medical expenses, lost wages and other expenses and damages, including pain and suffering. Mr. Hutson represents victims who have been injured in accidents through no fault of their own. And he is a cyclist himself and recognizes the frustration that negligent drivers can cause. To make the streets safer for all bicyclists, Mr. Hutson seeks to hold those drivers who cause severe injuries and death accountable to their victims. To schedule a free consultation to discuss a bike accident claim, call The Hutson Law Firm at 623-628-7400. Mr. Hutson is an understanding and compassionate Phoenix Personal Injury Lawyer and will be glad evaluate your case and discuss your legal options. Mr. Hutson accepts accident cases on a contingency fee agreement, which means that you will not owe attorney’s fees unless and until you win a settlement or award. The Hutson Law Firm, PLLC, is a dedicated personal injury law firm that helps accident victims recover. Contact Randal Hutson for a free consultation TODAY! © 2019 The Hutson Law Firm, PLLC.